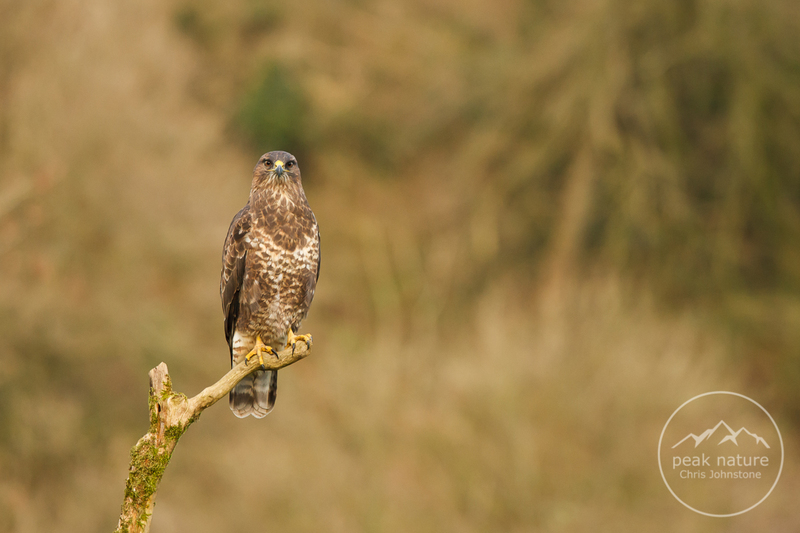 Over the last three months I've dedicated a lot of time to photographing common buzzards from a permanent hide setup. The mild English winter means their survival chances are increased but can also mean they are less inclined to visit the hide. Yet, like all good scavengers, they will not often pass up the chance of a free meal. 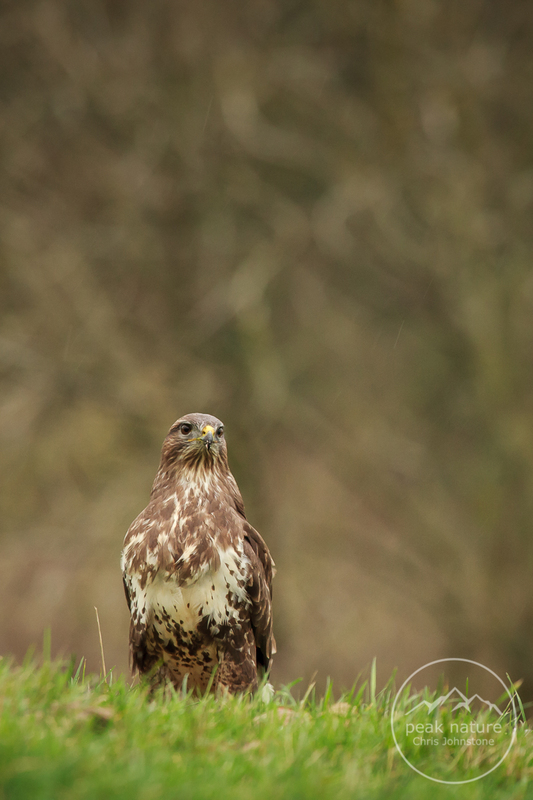 For several years now, I have been photographing common buzzards in my local area. Initially, I had set up a small hide on top of a hill overlooking an area of farmland towards a small town. Results were varied that first season with a few wonderful experiences but a lot of time coming home with nothing to show for many hours of waiting. Over the next couple of years, the visits increased and it became clear there were regular visitors to the site. I tried to avoid giving the buzzards names mainly because the biologist inside me knows it's silly but after 4 years of spending time watching these animals, it's hard not to get accustomed to their individual behaviours and anthropomorphise them a bit. After replacing what was quite a small, shabby hide with a far more comfortable construction in April 2015, I made it my mission to spend a decent amount of time road testing the new hide and seeing what kind of images it might help me produce. 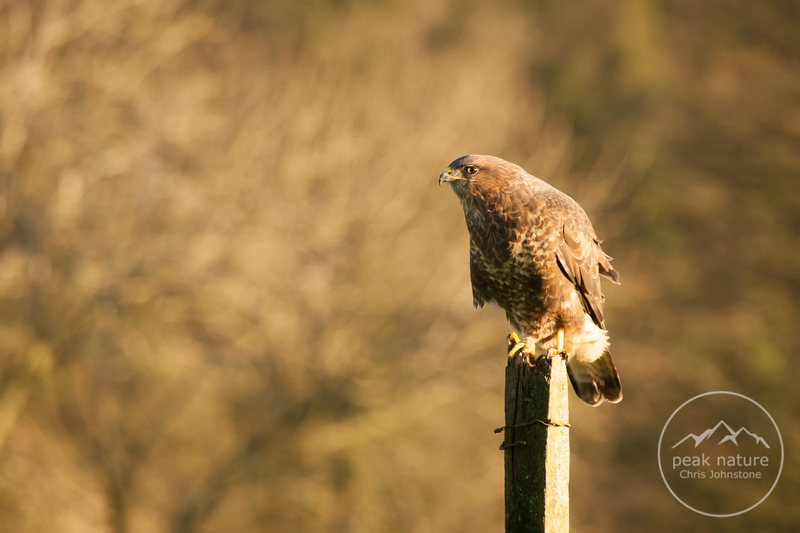 So, with some spare time in November, I set aside a day a week to photograph the buzzards and build up the portfolio of the individual birds that dropped in. From previous year's observations it was clear that there was a pair of adults in the vicinity who patrolled an established territory near the farm where the hide was positioned. One of the adults was a regular visitor. 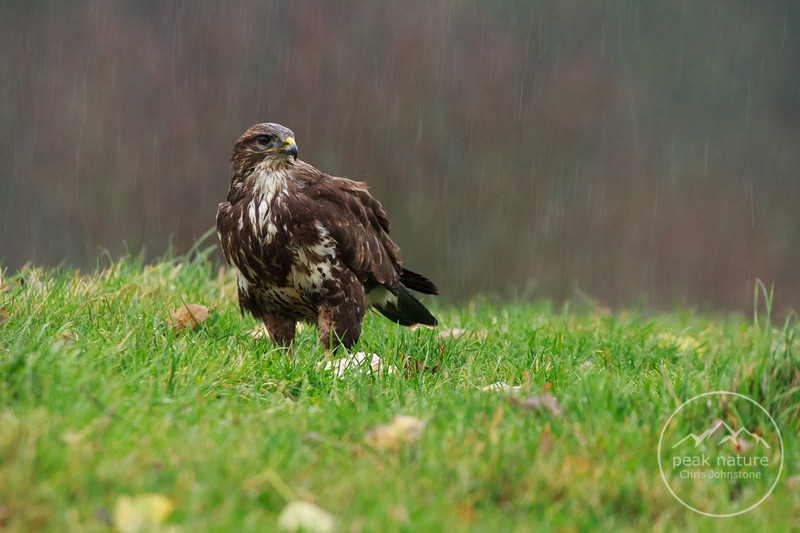 With most birds of prey, it's difficult to tell the gender of an individual just by appearance. 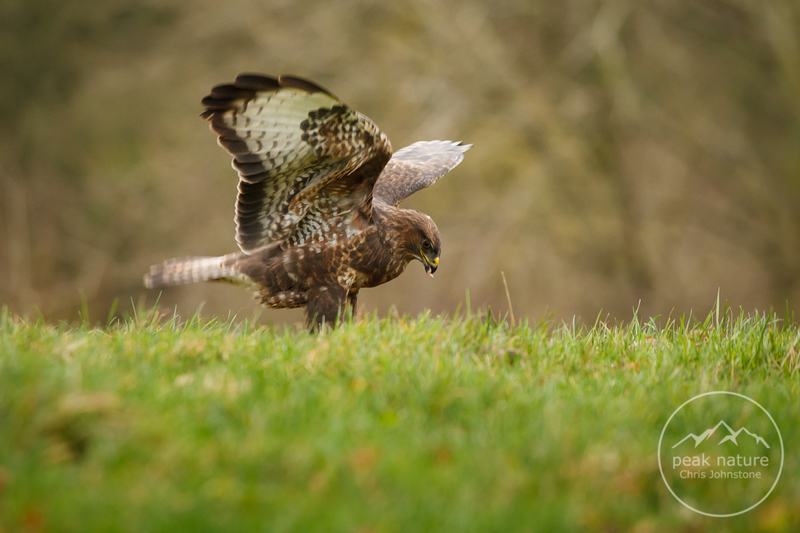 As a rule of thumb (and in the case of buzzards), females are bigger by approximately a third but without a male to compare them to it's tricky to tell. Aging the bird is slightly easier in that their feathers grow darker the older they get, especially round the breast but having said that, there is huge variation in plumage colour as you can see below. 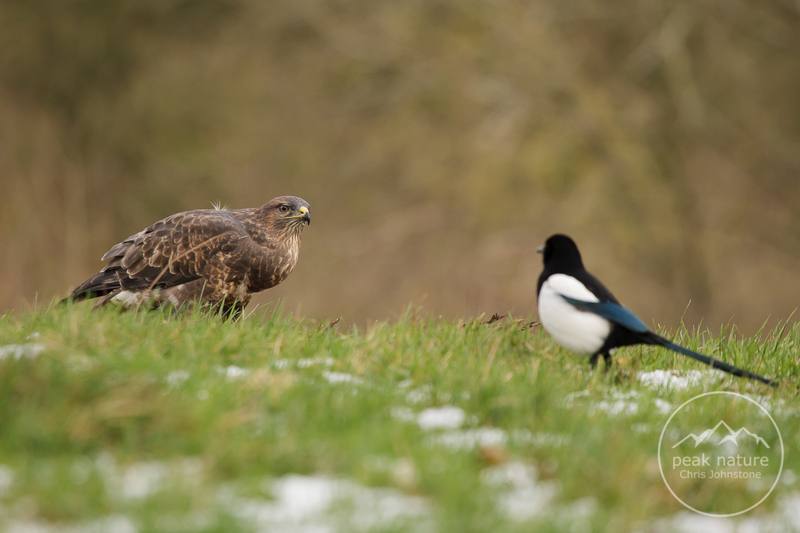 Magpies frequently follow buzzards around in the hope they might be able to scavenge part of a kill but more often because they like the buzzard to make the first approach to any carrion, making sure the coast is clear before pestering and harassing the poor buzzard while it eats. 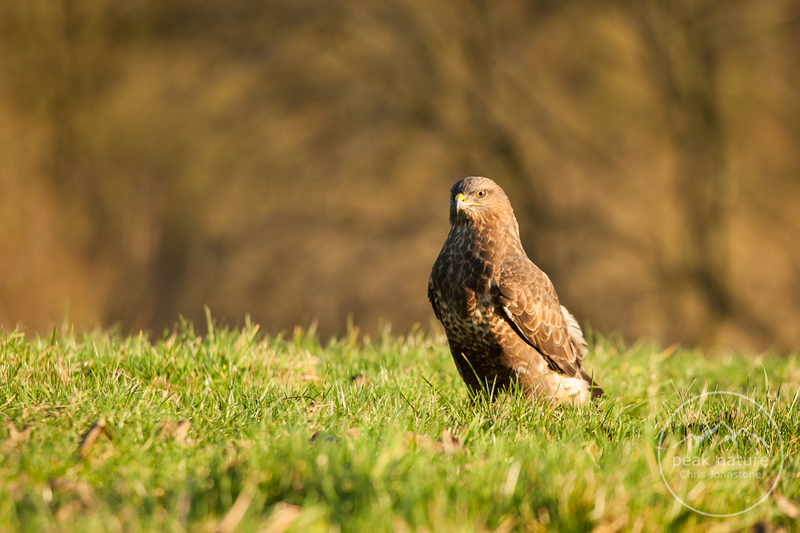 It's not uncommon to have crows and magpies pull the tail feathers of the buzzards in order to move them off the food. For photographers, magpies are quite handy - they're noisy so are usually a good signal that a raptor is about. As far as I can tell, Woody is one of the birds that owns the territory in which the hide is located and, since November, the only adult that visits the hide. So called because there's always a feather or two out of place, Scruffy is frequently seen as the hide. I expect he's one of the offspring of Woody and partner since he's been around for so long. Woody and Scruffy are fairly tolerant of each other in as much that if one of them is eating, the other hovers around the periphery until the first one is finished. However, there is the odd scrap. 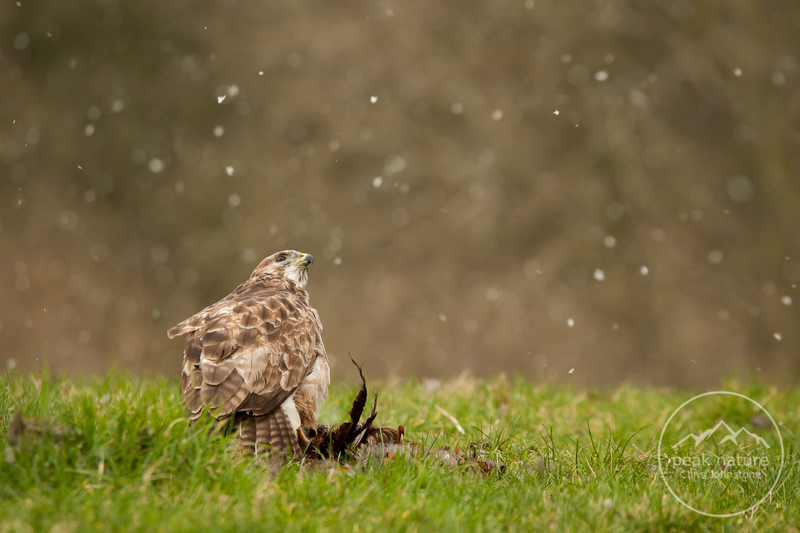 In this case, Scruffy is seeing off Woody in a flurry of feathers. 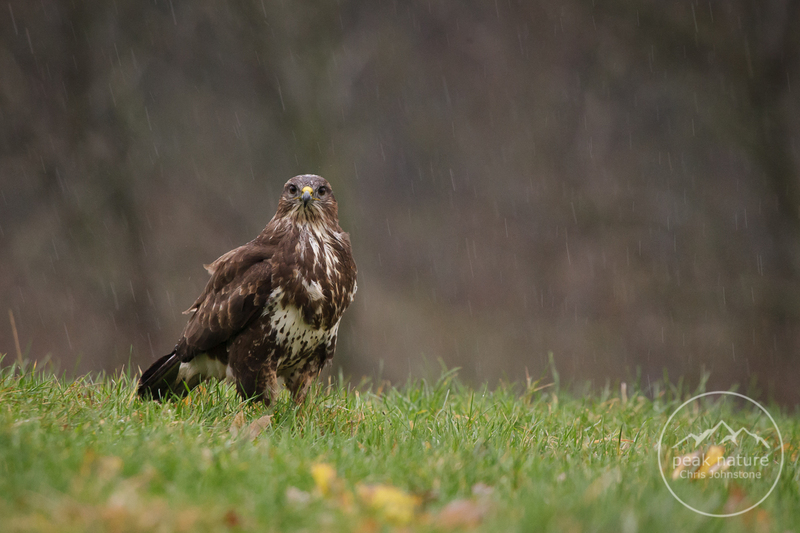 Throughout November and the beginning of December, there was a lot of rain so the majority of Scruffy's visits meant looking pretty bedraggled but added some lovely rain streaks to the images. 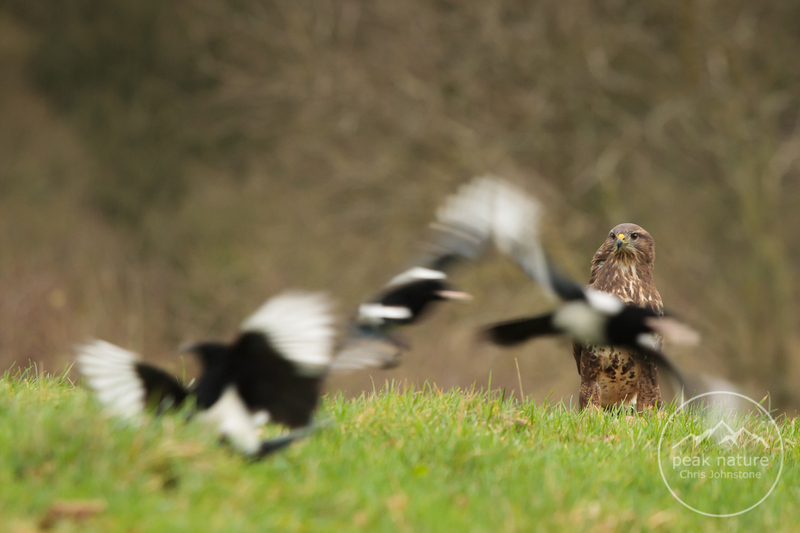 Unlike Woody, who knows to ignore the magpies or sort them out if they get too close, Scruffy is usually on the receiving end of their harassment, especially when he's outnumbered. The dull weather meant challenging conditions for shooting but the flat light makes for some really earthy images and a bit of motion blur from the frantic magpies. Christmas was now approaching and this year, I was off to Scotland to see my family. Luckily, a few days before I was due to leave, there was a break in weather and the low winter sun provided some strong side-lighting on Woody who looked terrific in the golden light. These images are all shot with a zoom lens. I've been working exclusively with a maximum focal length of 400mm given that not everyone visiting the hide has a 500mm lens. 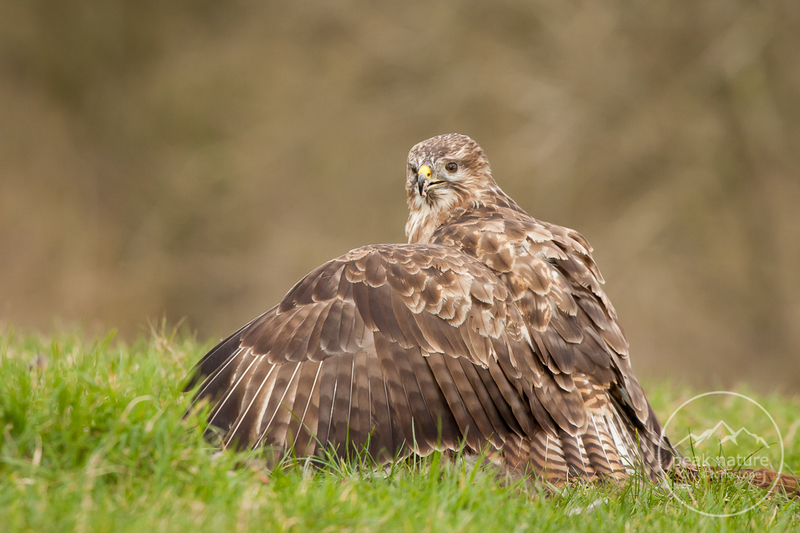 Some of the image have been cropped so the buzzard will appear larger than it did in the view finder but a 300mm lens will still produce good results. Into the new year and Woody put in a couple more appearances, again looking in fine fettle. 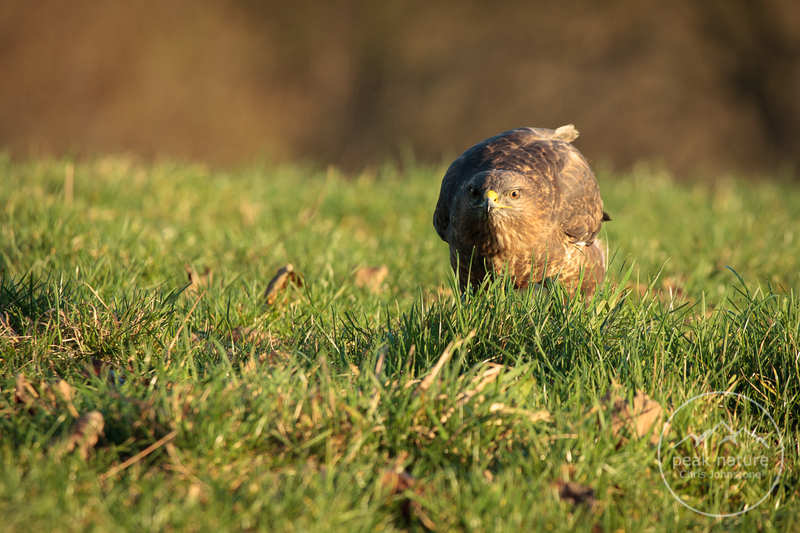 Come January, buzzards will be thinking about forming pairs for the forthcoming breeding season and actively patrolling their patch to shoo off any would-be rivals. Juveniles can often be driven away at this time as well to maintain a sustainable predator to prey ratio. The jury is still out as to whether this one is a youngster or just a very pale bird. One thing's for certain: he knows how to make an entrance. 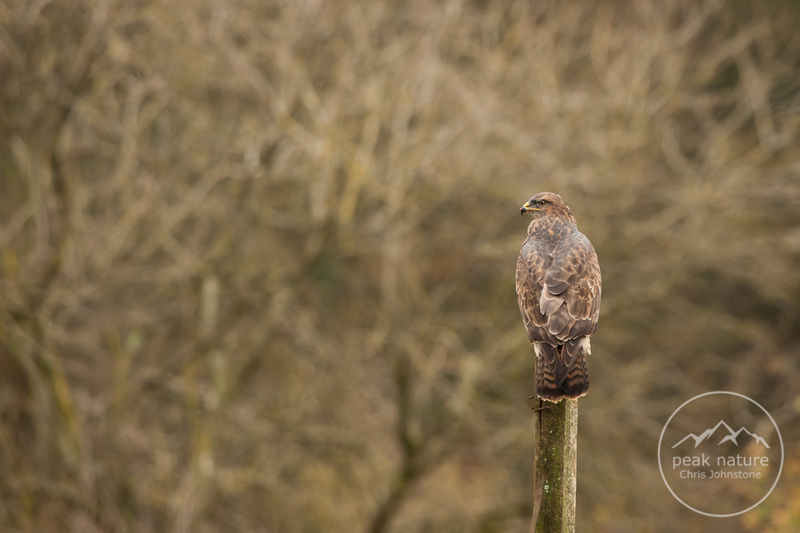 I had been aware a pale buzzard was visiting the hide throughout January but I had never had the chance to photograph it and only caught glimpses as it drifted over the farm. A recent visitor to the hide photographed a pale bird (which was a first) but I was certain it wasn't the pale one I'd noticed overhead meaning there were two new, pale buzzards coming in. Even so, I'd yet to see either of them properly. 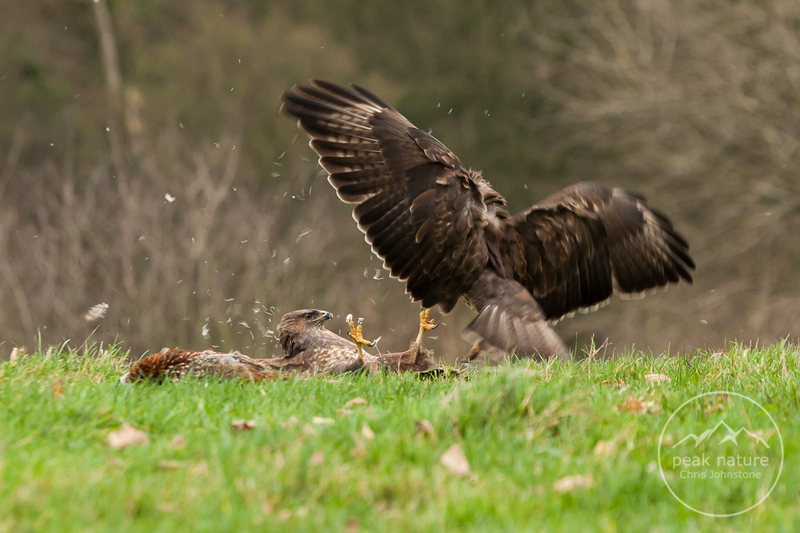 All became clear last Saturday when I got more than I bargained for after a chance 3 hours in the hide. 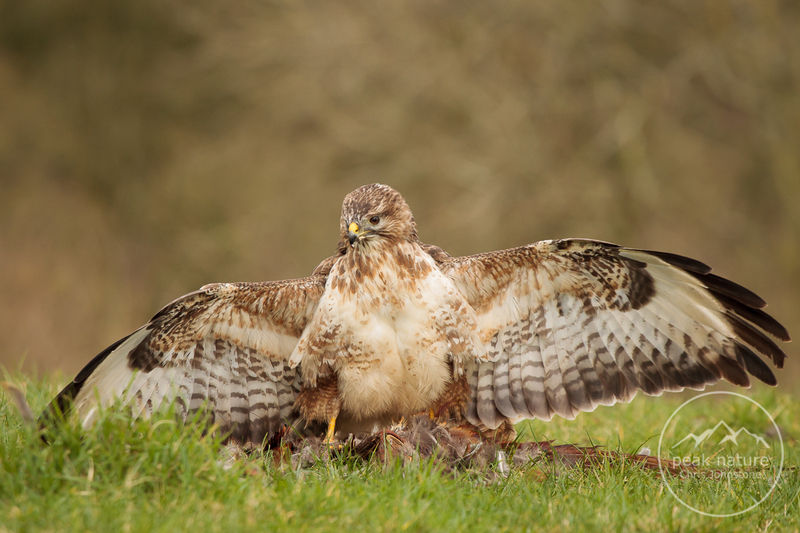 Scruffy had dropped in and was making a start on a pheasant I had provided when another bird arrived. She was very pale which sent my heart racing since it was an individual I had never seen on the ground before and never photographed. 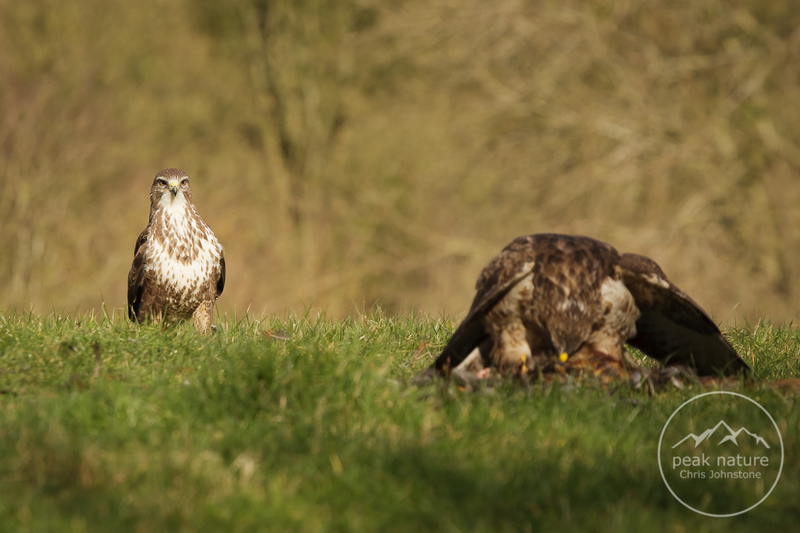 As I began to move my camera across to her a third buzzard charged in from over the top of the hide and challenged Scruffy to the food. After a quick scrap, Scruffy was forced to fly off and the third bird now controlled the food. Its left eye was quite distinctive giving it quite a mad, eccentric look and I instantly imagined Mad Eye Moody in the Harry Potter books. That, plus the unsociable behaviour really nailed the name. 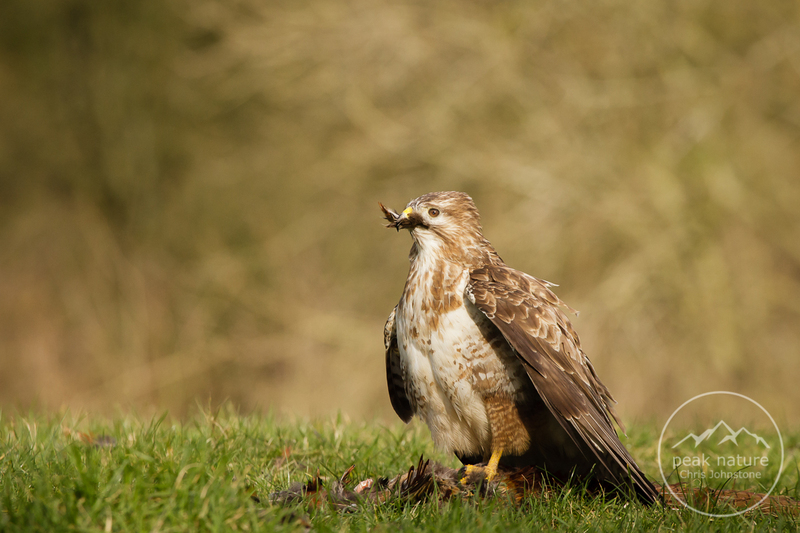 After things had calmed down, I realised I was looking at a second pale buzzard, not only pale on its breast but on its back, throat and crown as well. This was Moody and he was only interested in keeping the food for himself. Aggressively mantling over the food (covering it with his wings to hide it from others), Moody set about eating as quickly as possible which is usually a sign that it is a younger bird trying to get as much nutrition as fast as it can before an older bird comes along and bullies it away. Meanwhile, the first pale buzzard was still hanging about in the background, seemingly reluctant to come too close to Moody's erratic mantling. With all the action taking place next to the food, I hadn't yet taken a proper look at the shy bird. Zooming out to incorporate her into a wider shot, I could see she was an absolutely beautiful individual! I realised I'd named two buzzards with male personas in mind: Scruffy is the angsty, unkempt teenage boy and Moody the eccentric wizard. Woody could work either way but I thought I should even things up with a female and since her plumage was so pale, it didn't take very long to come up with Blondie. It's too early to tell whether Blondie is a juvenile or just very pale but her plumage is immaculate. 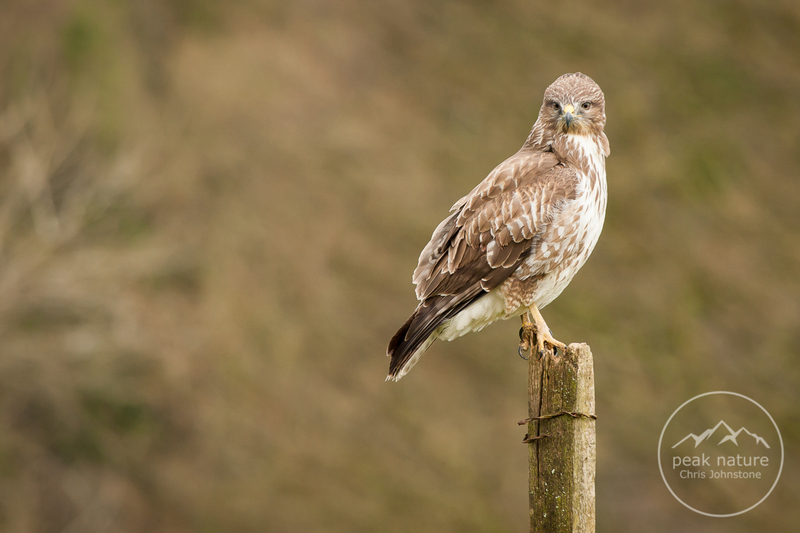 I've been lucky enough to see many different buzzards at close quarters, both captive and wild, and have come to appreciate their variation but in all those years, Blondie is easily the prettiest. She was going to have to be patient while Moody was eating. Very patient. For the next two hours, Moody sat picking away at the food, plucking almost every single feather in the process. Periodically, Blondie moved up into a tree then dropped in again as if to try and make her presence a bit more obvious but Moody was having none of it. At one point she jumped onto a post allowing for a wonderful opportunity to make a couple of portraits. Eventually, she got bored and left to leave Moody alone with food. 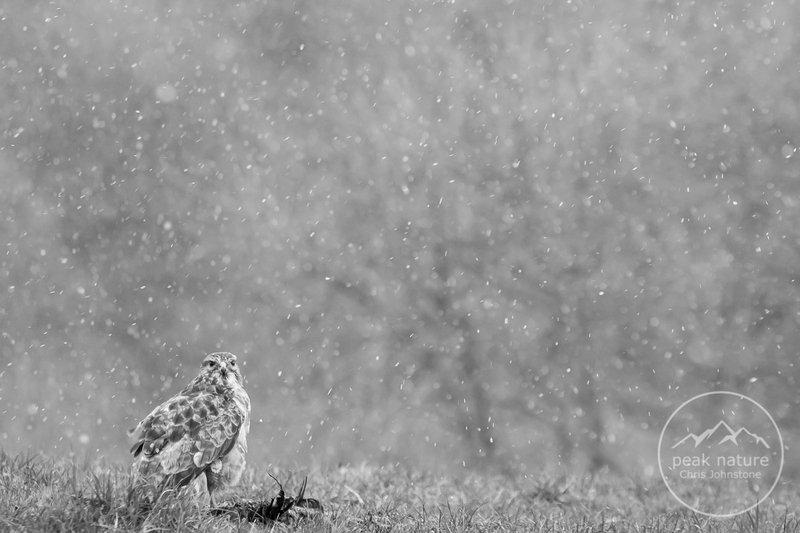 Having rattled off about 700 images so far, I was more than happy with the afternoon's work and as the light began to fade, I was preparing to pack up once Moody had moved away when it began to snow. Forget leaving, eye glued to the viewfinder again. This winter has been all but devoid of snow so any chance to create some images with this rarest of conditions is worth sticking around for. As usual, it was just a passing shower but I managed to capture a couple of frames. Moody looks as surprised as I was to see it. As you're probably aware, the hide is open to photographers until May wishing to see these fantastic birds up close.